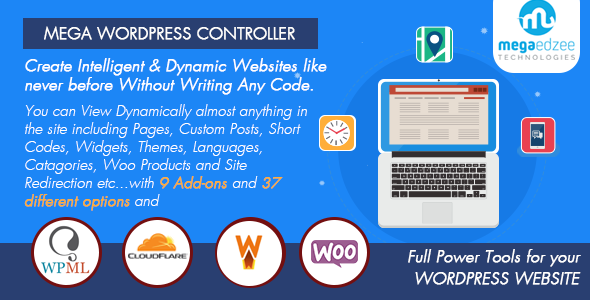 Mega WordPress Controller is a plugin suite contains Mega Enterprise Platform and 9 Mega Addons designed to Super Charge your WordPress site. Administrators can control almost anything in the site including Pages, Custom Posts, Shordcodes, Widgets, Themes, Languages, Categories, Woo Products and Site Redirection. Plugin also provides Google Analytics AddOn to keep track your site traffic. You can now have the dynamic presentation of your site like never before with zero coding necessary! CloudFlare CDN integration, WMLP compatible, Contact Forms, Caldera Forms, WordPress Multisite support, translation ready and high performance. WooCommerce, WMPL, WP Super Cache, W3 Total Cache and CloudFlare CDN. control elements of their WordPress site by the use of simple and complex rule logical rules. Using Redirect controller you will be able to redirect or even block your site visitors depending on different factors, such as their location (Continent, Country, State and City), language, IP, date, browser, mobile user, bulk or pattern redirect and more. Define redirect with almost everything like Geolocation, IP Address, Request URL, Third-Party URL, User Role, Guest User, Date and Time, Page, Post, Category etc with 37 different options and any combination. Allows redirection of users based on properties such as user profile, geolocation of user and date/time, etc. Supports simple rules based on singular properties, or complex rules based on mixed logical conditions with multiple properties. Allows redirection based on device type. Content Editor Filter is dynamically displaying the Short Codes or Content based on some business logic. Allows dynamic control of WordPress and WooCommerce categories based on properties such as user profile, geolocation and date/time, etc. Supports simple rules based on singular properties or complex rules based on mixed logical conditions based on multiple properties. Allows dynamic control of widgets based on properties such as user profile, geolocation of user and date/time, etc. Supports hiding or replacing of widgets. Allows dynamic control of themes based on properties such as user profile, geolocation of user and date/time, etc. Supports simple rules based on simple or complex rules based on mixed logical conditions based on multiple properties. Supports showing different themes based on user’s device. Show fancier themes for premium account subscribers. Allows dynamic switching of languages based on properties such as user profile, geolocation of user and date/time, etc. Configure custom language file for a specific City, Region, Country, User Role, User, Guest User, Date and Time, etc. Switch Language for a selected Country, City, State and Region. Supports WordPress Multisite: Configure analytics per site. Summary View: Provides the maximized view of the report, which give the summary of the site analytics. Dashboard: Plugin provides a dashboard widget, which shall be configured in the Site Dashboard. Configure Reports: Plugin provides user friendly way to add required reports using the settings option.